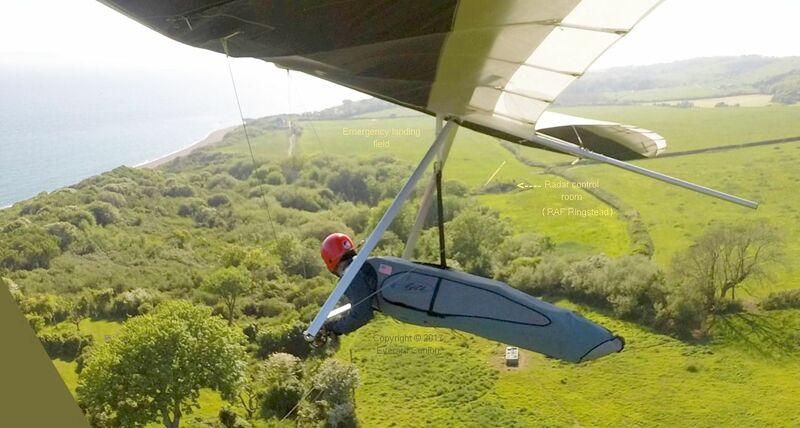 Ringstead, on the coast of Dorset, England, provides excellent cliff soaring conditions for hang gliders (in strong winds) and paragliders (lighter winds). However, it is potentially dangerous and you need to become familiar with the club site guide and associated rules before flying there. 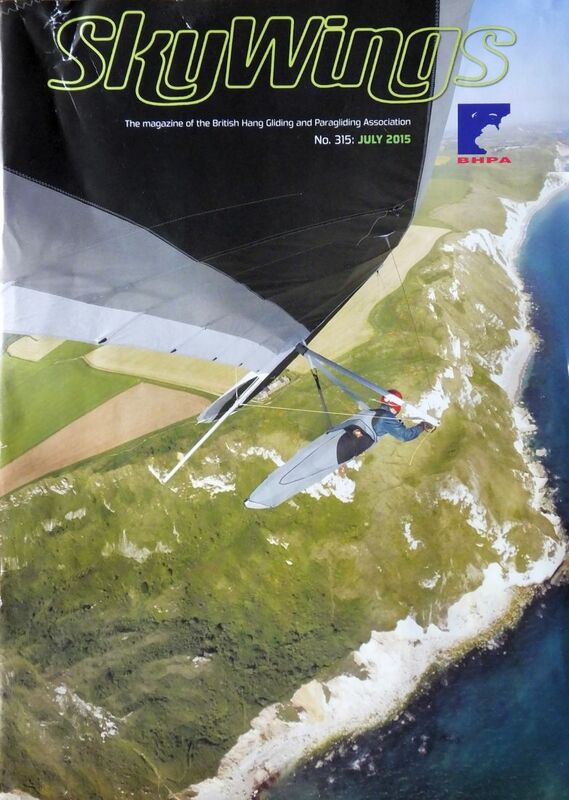 Therefore, although this page contains some flying information, it should not be used as a flying site guide, but more as a sight-seeing guide. It contains photos I took on the ground and in the air specifically for this page and some additional flying photos that already appear on other pages. This view takes in the take off hill (some distance inland from the cliff, which is out of view) and the public parking area with the top landing field (nearest the camera) separated from the car park by a hedge. The notice in the following close-up is visible at lower left in the top landing approach photo. From the public car park at the top of the hill you can hike downhill along a partly forested trail to the beach or you can go straight ahead to the cliff top. The building on the right in the middle distance is the farm house surrounded by a rectangular hedge at upper right in the following photo. The wooden building at left in the following photo is the one with the grey roof by my right elbow in the aerial view. 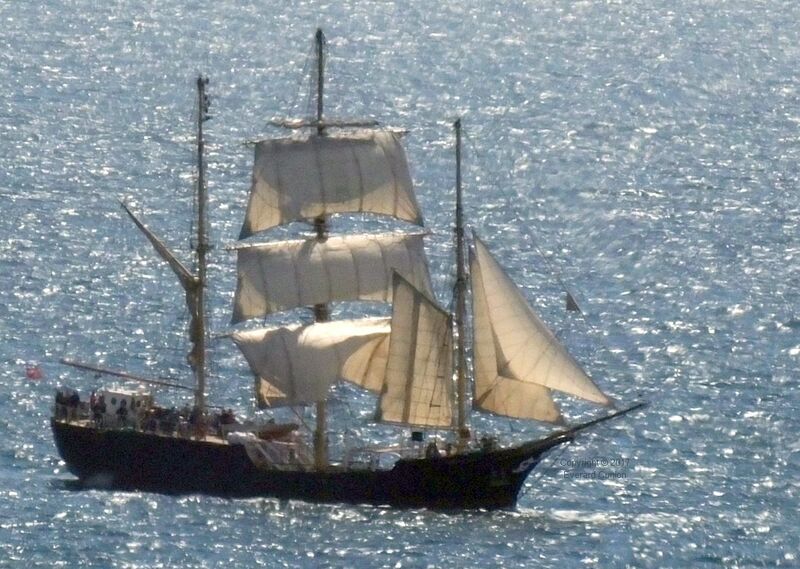 The navy helicopter base on Portland island, visible some miles off shore, was closed some years ago, but ships and boats of all kinds – sometimes including warships – can often be seen in the bay. 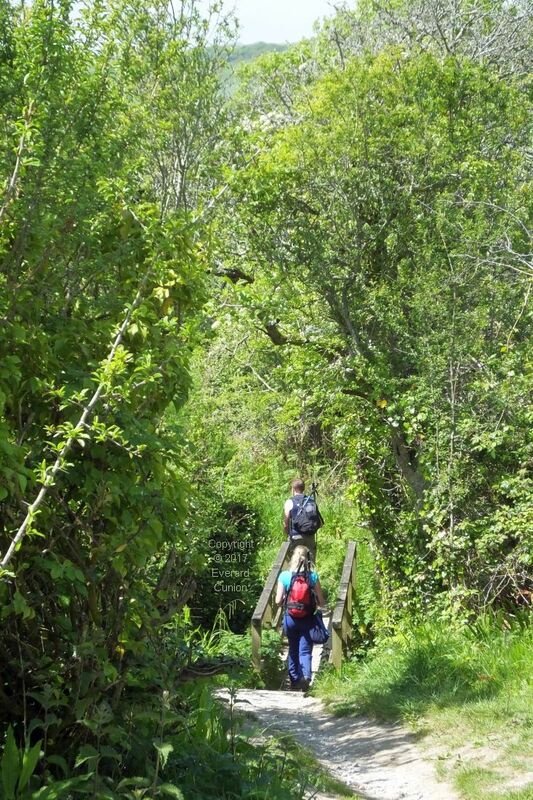 The path to the beach is steep enough in places to have wooden steps added. In winter it tends to be slippery with mud. This trail is great for your impromptu Vietnam War re-enacting. 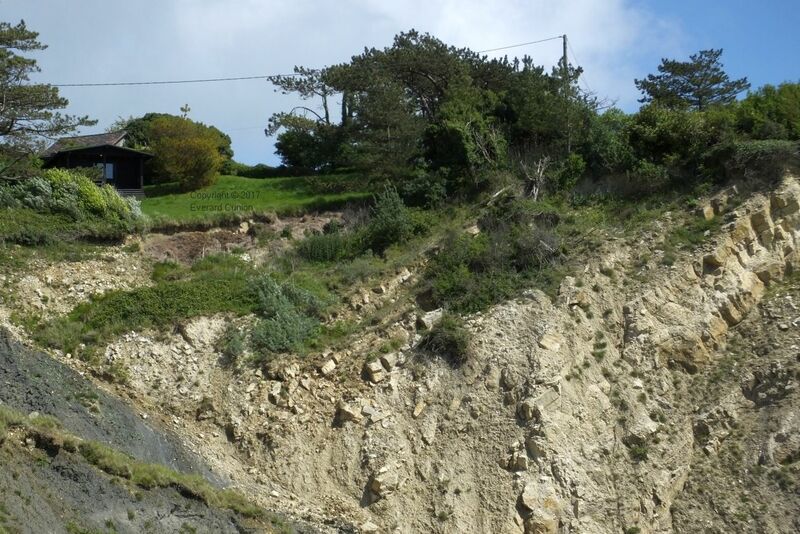 The public path along the top of the cliff gets too close to the edge for comfort, in my opinion. 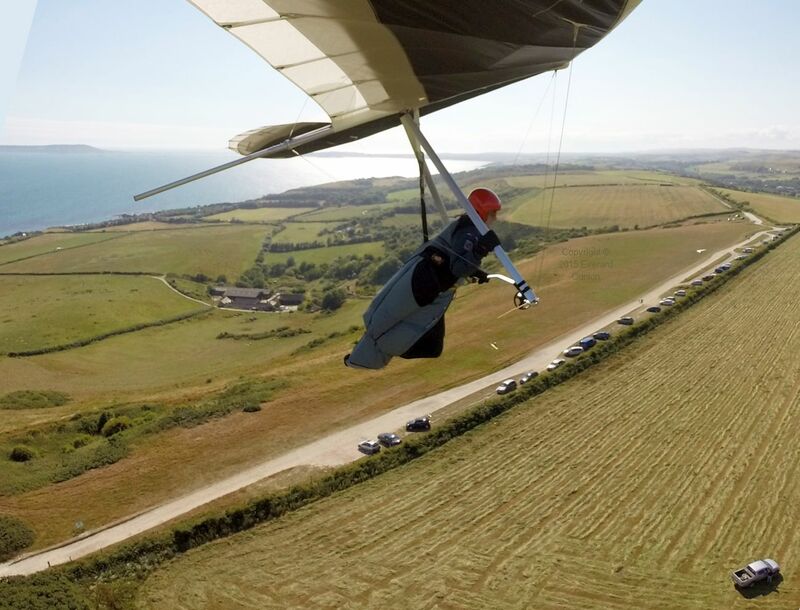 When the wind takes on a more southerly direction, you can fly to Lulworth Cove and beyond. However, emergency landing options are either limited or nonexistent for much of the route. 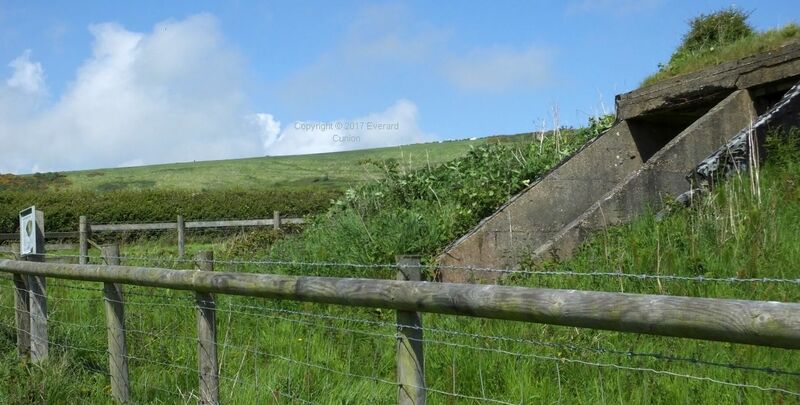 The emergency bottom landing field is – or was – RAF Ringstead; a radar site during World War 2 and a radio communications site during the Cold War. The radar room (the transmitter block) is locked, but a sign near the entrance includes a diagram and some explanation. In this photo, vehicles parked on the hill top, from where we launch, are visible in the distance. 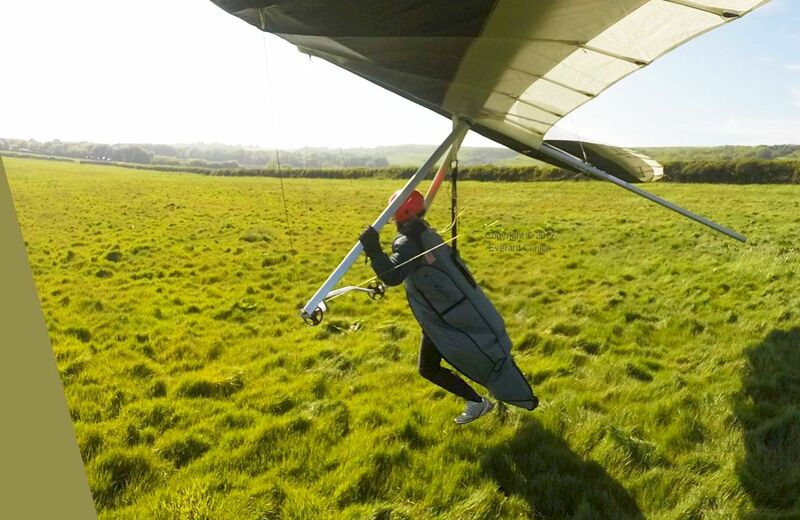 The field slopes slightly away from you – you always land in the direction the camera is looking – but I never heard of anyone running out of room. 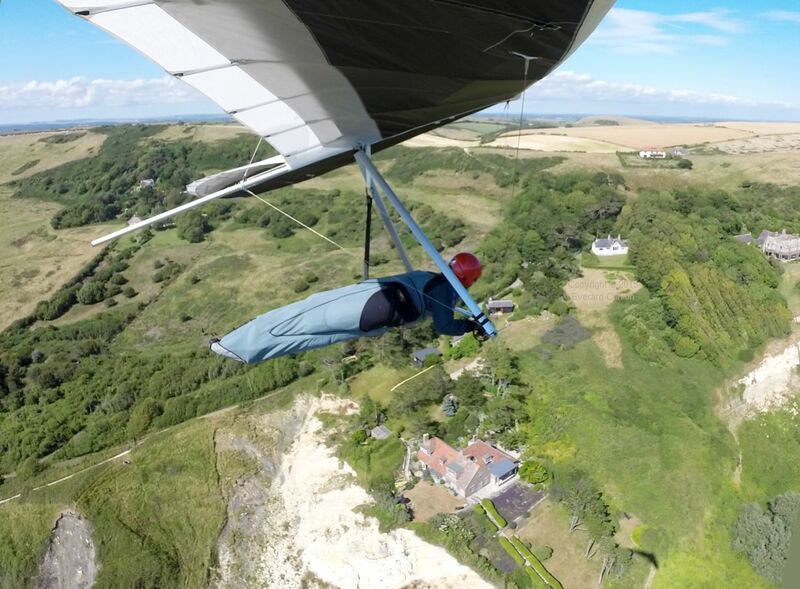 Here are some photos of an approach and landing after I failed to obtain enough height to safely test the lift at the cliffs without risking a beach landing, which you must avoid if possible. 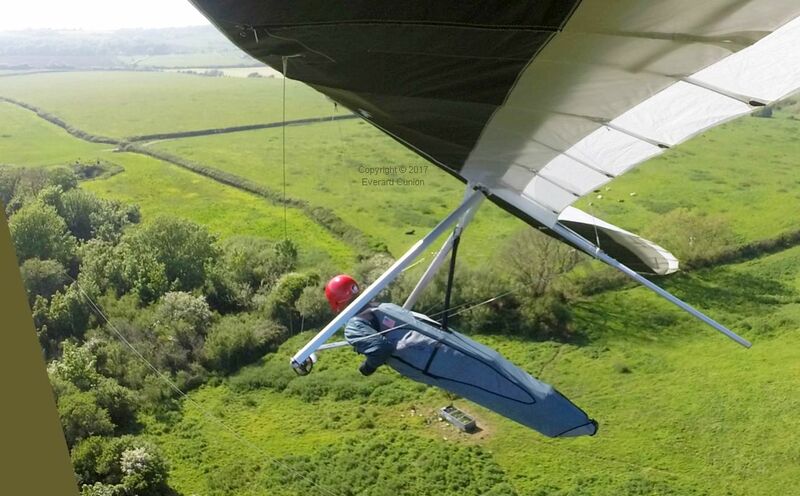 If you are unfamiliar with hang gliding equipment, it is worth mentioning that even with the harness unzipped (by pulling a chord) I am held in securely with leg loops and a chest strap all with strong buckles. I landed where the darker grass clumps can be discerned in the photo taken from my ground camera. (About where I placed my copyright notice.) They are less than a third the way along the field. 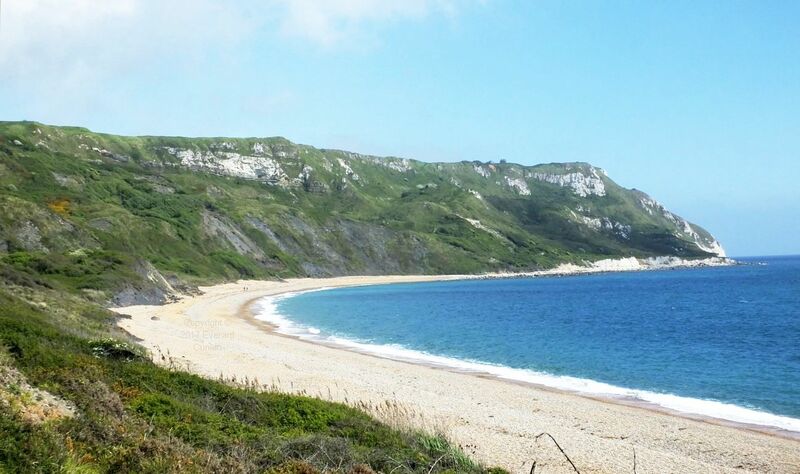 RAF Ringstead continued to be used after World War 2 and into the cold war against the Soviet Union. Its aerials were rebuilt as part of a ‘Tropospheric Scatter System’, linking the United States Air Force command bunker at RAF High Wycombe, Buckinghamshire, with sites in Spain, Morocco, and at Wheelus Field near Tripoli in Libya. These aerials, said to be 150ft high, were decommissioned in 1970 and dismantled in 1974 — just a few years before hang gliders started flying there and using the transmitter block field for emergency bottom landings. 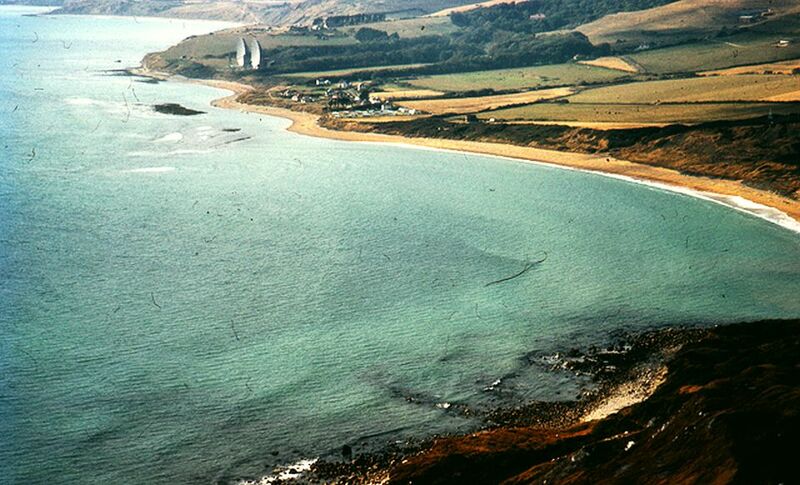 The photo of Ringstead Bay in about 1970 is by Ronald Searle (licensed for reuse under the Creative Commons Licence). I increased its size by 50 percent to make it clearer on modern monitors. Earlier photographs show the taller and more conventional looking radar masts sited a bit more inland than these more substantial aerials appear to be. 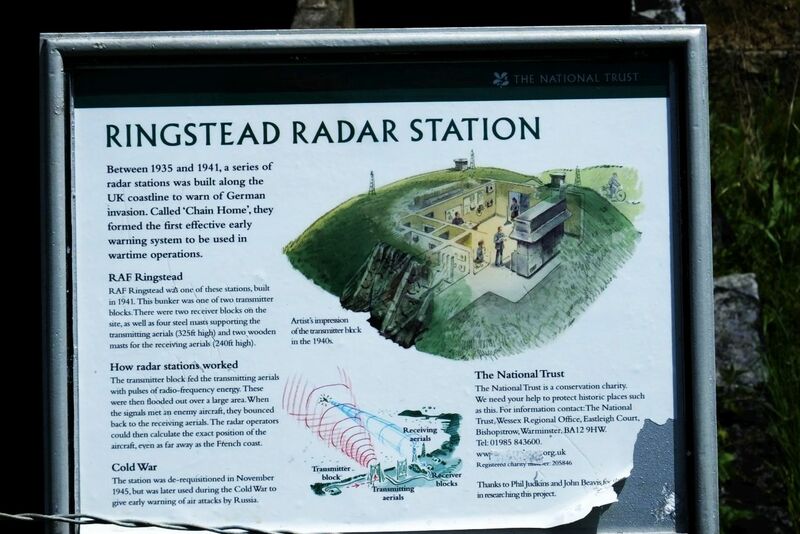 The National Trust artwork shows two pairs of aerials of different construction; for transmitting and receiving of radar rather than the later communication aerials. 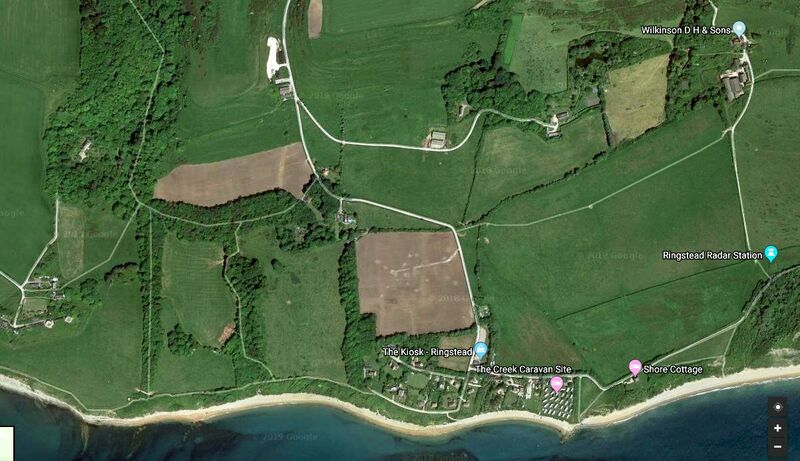 The aerials were at the front (seaward) edge of the two fields bounded and bisected with rows of trees to the left of the label The Kiosk – Ringstead in the satellite image. (That is, with the tan field above and a tan field on their right.) 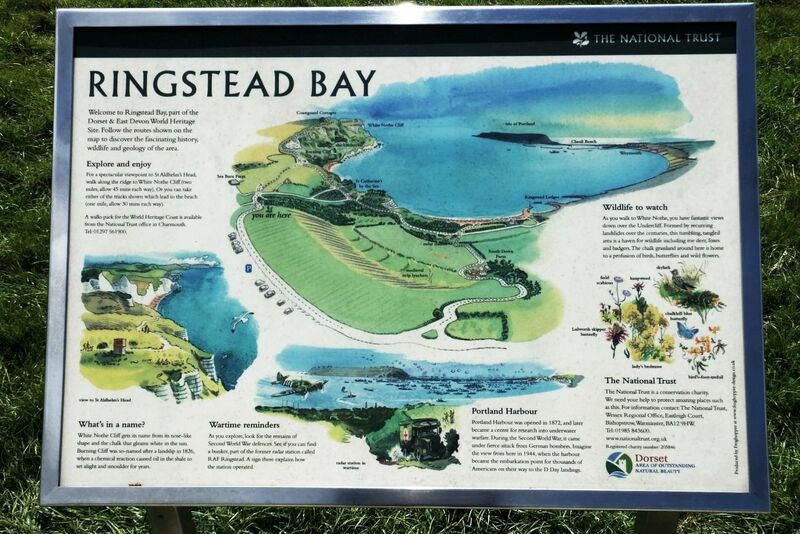 They were some distance from the transmission block, labelled Ringstead Radar Station.